Galaxy Note 4 was like a game changer for South Korean giant Samsung. It is no more a mid range product. Now its turn of Galaxy Note 5 that is pretty sure to be a lot enhanced product. With 2K resolution Galaxy Note 4 is already a hum making device. On this context, Galaxy Note 5 is expected to be a device with 4K resolution. We have our eagle eye that has gathered enough spec details about the product. Reportedly, the upcoming Galaxy line-up product with model number SM-Z6400 will pack a 4K display having resolution of 2160 x 3840 pixels. This upcoming device is going to be a thorough performer as well powered by the eight-core Qualcomm Snapdragon 810 64 bit processing unit that can shoot videos of 4k. Though the source calls it a mysterious device, but this is just a formality. We know it is going to be Galaxy Note 5. Still, you can’t deny absolutely as long as nothing has been declared officially. If this is not the Galaxy Note 5, then chances are high for it to be a new edition of the Galaxy S6. It is here to mention that GalaxyS6 and S6 EDGE are in pipeline to appear in coming days. Reportedly, it will be a device with 2K display. There are analysts those speculate that the Note 5 is most probably going to be in front of the rival’s contender iPhone 7. Samsung-Apple clash has been at the top of interest for fans and everyone. We can’t deny this report as a speculation of those as well. MWC is a mega technology event and it is very approaching for the next edition. However, this MWC is going to be a special for the hybrid size phablets. Apart from Galaxy Note 5, there is HTC Hima Ace Plus which is being compared as well with Note 5 in top of the discussions these days. Yes, LG G4 is also there in the comparison list. 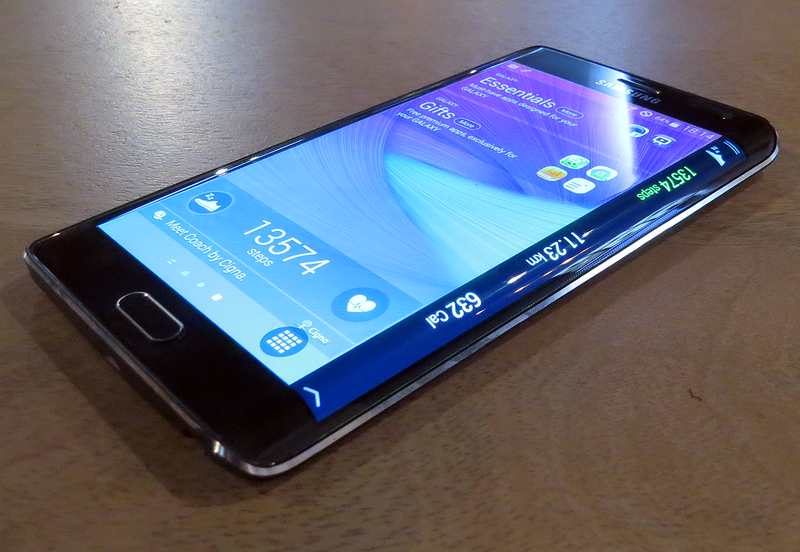 Reportedly, the upcoming Note 5 is going to be pretty equivalent as of the Galaxy Note Edge. We say so as both are going to sport curved display at both parts. All eyes are on for this to come, definitely. MWC will bring much interesting on this regard as well. Taking a brief sight over the specs, the Galaxy Note 5 is expected to be a device packing a 5.9 inches AMOLED display with 4k resolution. In terms of snapper, there will be a 19 MP snapping option at the main end along 4.7 MP front facing shooter for video calls. There will be 3700 mAh battery also to power the whole system. The eight core processor will be rotating at 3.2 GHz. Believing the rumour mills the product will be packing an Exynos 7420 chipset with four Cortex-A57 cores and fourCortex-A53.